Couple of weeks ago, my parents had come and stayed with me for a few days. My father likes my cooking and I had made this Baingan Ka Salan/ Eggplant/ Brinjal curry one day to go with a pilaf. He liked it so much and even asked my mom to note down the recipe. 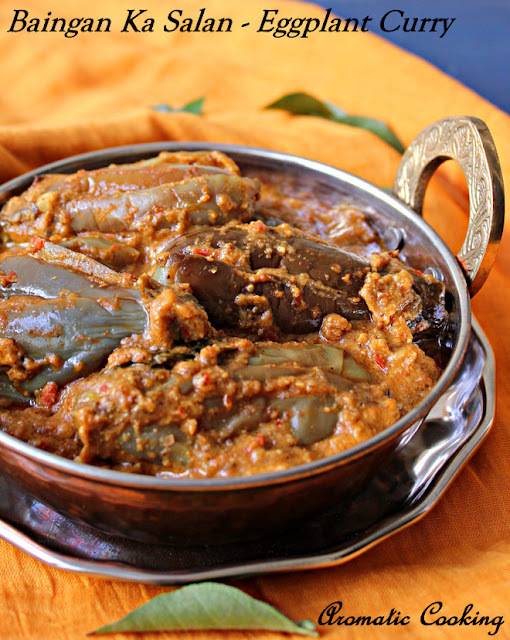 The eggplants are cooked in a rich and spicy peanut and sesame seeds gravy and it tastes really good. Though this dish is traditionally served with Briyanis, it goes equally well with rotis or naans or I can eat it with even plain toast..
Toast the peanuts and peel the skin. Dry roast the coriander seeds, cumin seeds and sesame seeds and cool. Grind it all together along with the other ingredients given under 'to grind'. Slit the eggplants 'crisscross'. 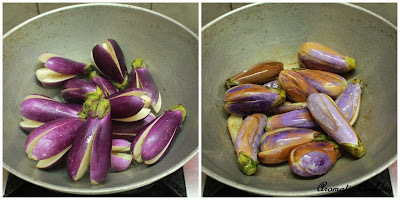 Heat some oil, add the eggplants and keep sauteing till they start turning soft, start changing color and almost half cooked, remove and keep. In the same pan, add some more oil, add the minced onion and curry leaves and keep sauteing for 2 or 3 minutes, till the onion starts turning golden. Now add the ground paste and keep mixing for at least 5 minutes, till the raw smell goes. Then add the tomato puree and keep cooking for another 3 or 4 minutes. To this, now add the eggplants, mix, add about 2 cups of water and salt, bring it to a boil, then reduce the heat and simmer for about 10 minutes. You'll see the oil oozing from the peanuts and sesame seeds and floating on the top. Switch off at this stage, serve it warm with rice or rotis. Usually they add tamarind extract, I replaced it with tomato puree. While toasting the coriander and cumin seeds, add the sesame seeds at the end, and toast on reduced heat, otherwise, it starts splattering everywhere. Make sure that the gravy is slightly thin when you switch off, it thickens as it cools. We had almost the same today for lunch,but i prepared mine with sesame seeds, peanuts would have given a excellent flavour too. Perfect with briyanis, anyhow it suits with all tiffin varieties too. The curry sounds delicious; perfect accompaniment for rice Hema. 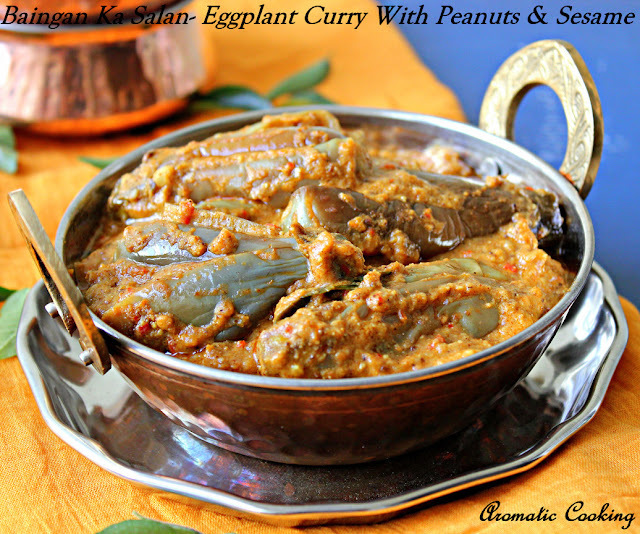 love brinjal n peanut-sesame combo, this sounds too good and flavorful n tasty curry...great accompaniment for rice...will surely try this! nice presentation and looks delicious. Nutty, spicy & delicious gravy!!! Delicious combo of eggplant with peanut and seasme. All the ingredients are making us to believe it must have tasted good, nice. I would like to use tamarind instead of tomato - how much tamcon to add? You can add the extract from lemon sized ball of tamarind, or if your adding the ready made tamarind paste, then add about a teaspoon of it.